Peggy and the boys sip on Bacardi for inspiration but find none. Copywriter Paul snits, “We’re supposed to sit here and pretend we’re on vacation?” Peggy and Smitty try wordplay with portmanteaus like “Bacardi-licious” and “Bacardi-Eisenhower.” After some deliberation and experimentation with non-alcoholic substances, Peggy begins developing an idea that we often see in today’s beer and cocktail campaigns—the idea that alcohol can whisk us away to some exotic paradise without ever leaving home. Visualizing a hammock set up on a city rooftop, Peggy turns Paul’s negativity into a positive selling point. In reality, Bacardi stuck to the more traditional messages of product use and benefits. No island getaways, no allusions to tropical fantasies, and no visual connection to Bacardi’s Cuban roots. 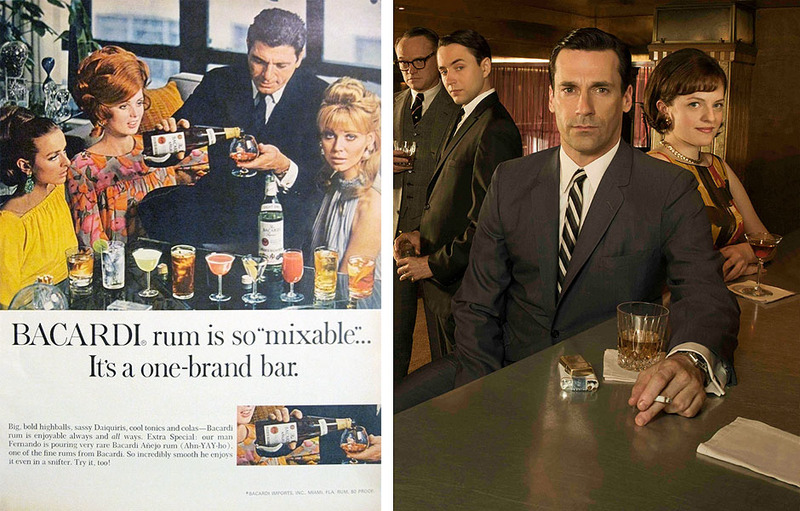 Was the company merely following suit in the style of liquor advertising of the day—cocktail recipes for home entertaining—or was Bacardi distancing itself from Cuba as political turmoils brewed? The whole concept of liquor-fueled fantasy vacations didn’t materialize until the late 1970s. Until then, the beer and spirits advertising alternated between depicting imbibers gathered around a bar/entertaining at home and solely featuring the liquor/beer bottle as the star. Bacardi did actively pursue a reputation as a mixer, not just for rum & Coke and Daiquiris but also as a substitute for other liquors in popular cocktails. Fun fact: Bacardi once tried an advertising tact touting its rum as a low-calorie diet drink mixer, even featuring in joint promotions with popular carbonated beverages. If only Peggy and the team had known this, they could’ve created a “Mindsticker” of a campaign combing Bacardi and Patio.